Madeleine Thien, a Vancouver native, was born in 1974 to parents who are Malaysian-Chinese immigrants. She graduated from the University of British Columbia’s prestigious MFA program in creative writing. Thien received the Canadian Authors’ Association/Air Canada Award for most promising writer under the age of 30 in 2001, and previously won the Asian Canadian Writers’ Workshop Emerging Writer Award based on the manuscript for her short story collection Simple Recipes. She is a former editor of Ricepaper magazine. Madeleine Thien received the 2010 Ovid Festival Prize for an international writer of promise. Thien’s literary criticism and journalism has appeared in many Canadian and international publications. Toronto: McClelland & Stewart, 2006. Vivid, poignant, wise, at once sweeping and intimate, Certainty is a novel about the legacies of loss, about the dislocations of war and the redemptive qualities of love. When Lin Lin and her father move from China to Canada, it feels like nothing will ever by the same again. Learning a new language and making new friends seems impossible, but the gift of a Chinese violin helps to bridge the gap between old and new. Chang’s illustrations are from his animated film produced by the National Film Board of Canada. Toronto: McClelland and Stewart, 2011. … a beautifully realized and deeply affecting novel about the multiple lives we carry within ourselves. 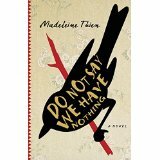 Spare and haunting, intimate and profound, it is an unblinking portrait of loss and recovered humanity that confirms Madeleine Thien as one of the most exciting young novelists in Canada. Longing, familiarity, and hope suffuse these stories as they mine the charged territory of relationships — subtly weaving in conflicts between generations and cultures. Thien’s characters in some way want to make amends, to understand the events that have shaped their lives. 1998 The story “Simple Recipes” was first published in the journal Event. It was shortlisted for the 10th annual awarding of The Journey Prize. It appeared in The Journey Prize Anthology: The Best Short Fiction From Canada’s Literary Journals (Toronto: M&S, 1998). Thien, Madeleine. “James.” Granta 114 (winter 2011): 159-184. 9th floor PS8373.1 .FR56 2011. Thien, Madeleine. “Photocopies of Photocopies: On Bao Ninh.” In Finding the Words: Writers on Inspiration, Desire, War, Celebrity, Exile, and Breaking the Rules, edited by Jared Bland. Toronto: Emblem, 2011, 148-155. Thien, Madeleine . “The Tongue, From Childhood to Dotage.” In In the Flesh: Twenty Writers Explore the Body, edited by Kathy Page and Lynne Van Luven. Victoria: Brindle & Glass, 2012, 27-32. Thien, Madeleine . “The Fire Before.” In V6A: Writing From Vancouver’s Downtown Eastside, edited by John Mikhail Asfour and Elee Kraljii Gardiner. Vancouver: Arsenal Pulp Press, 2012, 24-31. Thien, Madeleine . “After the Flood.” In Writing Life: Celebrated Canadian and International Authors on Writing and Life, edited by Constance Rooke. Toronto: McClelland & Stewart, 2006, 391-400. Byrnes, Terence. “Madeleine Thien at a Westmount Home.” In Byrnes, Terence. Closer to Home: The Author and the Author Portrait. Montréal: Véhicule Press, 2008, 92-93..
Thien, Madeleine. 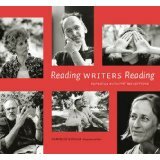 “The Meeting Place.” In Reading Writers Reading: Canadian Authors’ Reflections. Danielle Schaub, photographer and ed. Edmonton: University of Alberta Press, 2006, 46-47. Cuder-Dominguez, Pilar. 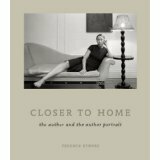 “Portraits of the Artist in Dionne Brand’s What We All Long For and Madeleine Thien’s Certainty.” Chap. in Crosstalk: Canadian and Global Imaginaries in Dialogue, eds. Diana Brydon and Marta Dvorák. Waterloo: Wilfrid Laurier University Press, 2012, 151-167. Morris, Robyn. “Under Surveillance: Memory, Trauma, and Genocide in Madeleine Thien’s Dogs at the Perimeter.” Chap. in Canadian Literature and Cultural Memory, eds. Cynthia Sugars and Eleanor Ty. Don Mills, Ont. : Oxford University Press, 2014, 309-321. Schwab, Dana. “Troublesome Bodies and Lonely Voices: The Embodied Woman in Contemporary Canadian Short Fiction in English.” M.A. diss., University of New Brunswick, 2009.